Many of us have this query about finding mobile number address and we have hard time Googling about it, but no clear answer. Here is the complete guide line which will help you get required details. Why do need the address? 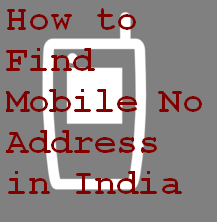 Getting the address is not quick and easy way in case if you are trying to find mobile number address of an India mobile phone. Through online websites we can get to know only following details. These details can give you clue about the caller. Note: Please note the location 'Gujrat' is the location from where the caller has purchased the SIM and hence at present it may not be necessary that the caller is in Gujrat. Websites which provide above details are as follow. From where we can get the address? You may try approaching your mobile service provider outlet/gallery but they won't provide you these details at any cost, instead they would suggest you to buy a new SIM or launch a Police complaint. How long will it take? If we launch a Police complaint I believe it would take around 2 Weeks to get the case investigated and help you find the caller name, address etc. Did you tried it? If you or your fiances\sister are getting calls from unwanted caller then I would refer you to read this article: Block unwanted mobile calls in easy wayPlease do your share experience or any comment.